*NEW! * Auction Traffic Explosion - Using eBay Auctions to Generate Visitors. Discover how a real life eBay PowerSeller who actually trades on eBay has legally built a list of over 26,000, 27,000, 28,000 subscribers and legally drives 1000s of visitors to his websites using online auctions and the viral power of eBay. 2. The Auction Traffic Explosion System. 5. Using eBay Auctions to Generate Visitors. 6. EBay Tools That Can Generate Visitors. 7. More Ways to Generate Visitors. eBay PowerSeller, Internet Marketer And Best Selling eBook Author. Before we get started I am going to point one thing out. Have you noticed I have already revealed my eBay ID? How often do you see that? I would also like to point out this eBook is written by me and I have not hired some ghost-writer to write this eBook on my behalf. So you are getting proven methods from someone who actually makes a living online using eBay. Not some faceless marketer who doesn't even have an eBay account. ... I have a confession to make. Check out one of my traffic reports for January 2007. Not bad for someone who can't optimise a website. Auction traffic Explosion has been one of the primary sources of reading material for me over the last 6 months. For me Auction Traffic Explosion is a no fluff comprehensive guide to generating traffic to your websites and auctions. This eBook is without a doubt a permanent fixture in my essential reading collection and I would recommend anyone to make it a fixture in theirs. Thanks John for the great information and the steady flow of traffic. I owe you one! More Traffic = More Sales = More Money In The Bank. You may not know this but there are over 30 different ways of driving traffic to your websites using eBay and information products. And it is all 100 compliant with eBay's terms. If you think about that it makes perfect sense, with the cost of Pay Per Click advertising rising all the time and the competition becoming more fierce everyday you can quite easily invest your hard earned cash into eBay and turn your auction visitors into lifetime customers. And this eBook will show you how. I have been working with John for around 2 years now. He is the person that originally got me involved in the eBay and internet marketing scene. Over those 2 years John has taught me endless amounts of valuable information - he is the ultimate eBay Guru! You are about to discover *proven* methods of driving traffic to your websites, squeeze pages and affiliate related offers. These are methods I have been using myself since 2004 and continue to use today. Most of these methods are still relatively unknown and you can start implementing these methods into your business within minutes. Over 30 ways to drive auction traffic to your websites. How you can use the tools eBay supplies to LEGALLY build your list. How to LEGALLY put your web address into your auctions. Why you should be selling info products and the tools you should be using. How to turn your buyers into sellers that promote you and ultimately make you money. How to turn auction visitors into subscribers. 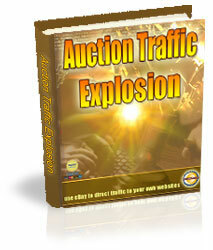 Auction Traffic Explosion contains quality information on how to turn auction traffic into website traffic. As usual, explained simply and to the point so anyone can understand it. All of the traffic building methods shown are really easy to implement and I am already seeing excellent results from them! Auction Traffic Explosion, yet another quality product from Planetsms! So how much would you expect to pay for this sort of information from a genuine eBay PowerSeller? Well you may be shocked to know I am only charging $17 for this eBook, I was actually going to charge at least $47 but changed my mind, for 2 reasons. I want as many people to read this eBook as possible and when you read it you will understand why. $17 puts this eBook within reach of the vast majority of people. Anyone who's not serious enough about their marketing efforts in 2007 to invest $17 into this eBook isn't going to take the time to use the methods laid out inside anyway. If this is a subject that interests you the price should not matter. Anyway, I just wanted to say well done, even if your sense of value isn't up to the same standard! who doesn't even have an eBay account"
John, let me say that you have opened my eyes wider than a freight train is long. I have been marketing online for almost 20 years and have never seen such down to earth honesty and absolutely no fluff whatsoever. What you say makes perfect sense and it works much better than I had expected. Congratulations and Thank You. If you are serious about your online business you will buy this eBook. If not then I wish you well, just think carefully next time that 'eBay guru' tries to sell you their next big thing. Or better still ask them their eBay ID for proof of their methods. Then watch them run a mile. I would have never believed it possible to drive traffic to my website from eBay with a report I wrote myself, but after putting John's simple steps to use, I realized the traffic to my website had doubled in less than a week. I kept it simple by writing a quick report, selling it for less than a buck on eBay, and then waiting. Within a week of selling my report, I was able to track the increase in traffic to the report. Fantastic results from my first report. Driving 1000s of visitors to your websites begins here. But you must first take action or nothing will happen. Yes John, I am ready to take action and learn the methods you have been using successfully since 2004 to generate a real online income. I am ready to learn how to use eBay to build a subscriber database by using proven methods you use every day that has seen you build your mailing lists to over 26,000 subscribers. I am sick of being ripped of by so called 'eBay Experts' who don't even have an eBay account. The fact you have already revealed your eBay ID tells me you are genuine. John, there are just a very small collection of no-fluff ebooks that have really taught me everything I need to know to build my business. Strangely enough, most of them have your name on the front cover! Auction Traffic Explosion is just brilliant. Thanks once again. P.S Seriously, for just $17 I'll teach you the methods I use every day to drive hundreds of visitors to my websites. Did I mention that I usually add over 100 people a day to my mailing lists and at the time of writing have over 26,000 subscribers? How I do it is explained in the eBook. Well hey John, What can I say? For someone newish to the internet business world all I can say is that you have helped me quite a bit! Thanks John for helping to grow my eBook business through Auction Traffic Explosion. I have bought and read all of your eBooks and they are all easy to understand and straight to the point, and Auction Traffic Explosion is no exception. I have put all of your advice to good use and have to say it actually works! Keep up the great work!